PARO The flight into the Himalaya reveals breathtaking views of the great peaks MT.EVEREST, MT.KANCHANJUNGA, MT. CHOMOLHARI , MT.JICHU DRAKI, etc. taking you right into the Dragon Kingdom 's scraping airstrip at PARO. On arrival you will be greeted and transferred though the beautiful PARO valley to Hotel. The flight into the Himalaya reveals breathtaking views of the great peaks MT.EVEREST, MT.KANCHANJUNGA, MT.CHOMOLHARI, MT.JICHU DRAKI, etc. taking you right into the Dragon Kingdom's scraping airstrip at PARO. 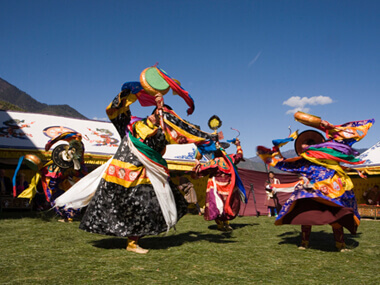 On arrival you will be greeted and transferred through the beautiful PARO valley to Hotel. Evening talk and slide show on Bhutan - dinner and overnight stay at hotel. Morning sightseeing to BHUTAN'S NATIONAL MUSEUM-TA DZONG -Drive to THIMPU including visit to the DRUKGYA DZONG (18km) on the way offering magnificent view of MT.CHOMOLHARI. Check in to hotel and visit THIMPU, the capital of BHUTAN including TASHICHHO DZONG (17th century) presently Govt. secretariat building - overnight stay at hotel with evening cultural program by ROYAL DANCE GROUP. Visit PUNAKHA DZONG, WANGDIPHODRANG DZONG - Drive back to PARO through DOCHULA PASS (10,496ft) offering majestic views of various BHUTANESE HIMALAYA - Overnight stay at hotel. After early breakfast, drive to airport for departure flight to your onward destination.